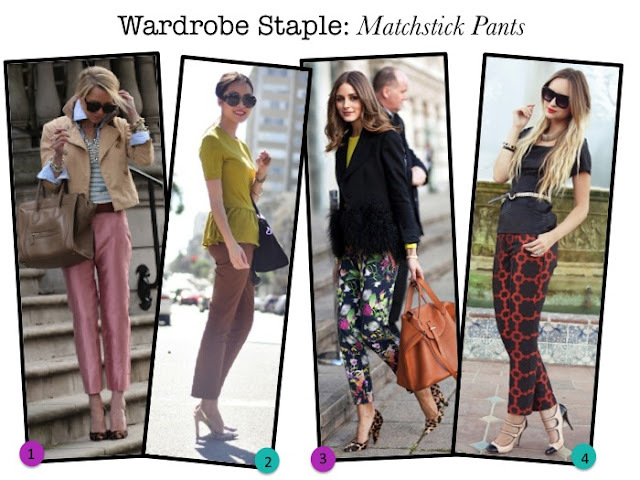 The matchstick pant, aka "slim cropped trousers," are a polished wardrobe staple perfect for working women or for those who are craving a tailored look. Think of them as the cigarette pant's perky younger sister. Tapered and cropped at the ankle, they are effortlessly chic and extremely flattering. When it comes to putting together a novel look around a classic shape bloggers do it better - exemplified by the ladies above. From Blair at Atlantic-Pacific's ladylike look featuring cropped metallic pants to Olivia Palmero's fun floral print trousers, there are countless ways to style this true wardrobe staple. Lucky for us, these little gems are available in color and prints galore. I just got a pair of pants like this but from H&M, really chic. If only if I can pull them off! I just look retarded and short in those gorgeous trousers!! They look so chic and sophisticated! these are really cute! im digging those floral ones! So cute...especially love OP's floral pair !! great picks! i love the silhouette of this pant. thanks for the links too! I love this style! I thinks it's so chic and it's perfect for showing off awesome heels! Those are awesome! i really need to get myself a pair for fall! Omg, how amazing are Olivia's pants?! I love the ones you chose too, such a fun trend! Are they really a staple? I had no idea. They are lovely. not really a pants person, but I totally want to try these out! they create such a polished and sophisticated look. J.Crew has the best ones! I've been wearing them for a long time, they are so classy. Is it weird that I really just want to start the working world just so I can don some of these? So cute and classy! 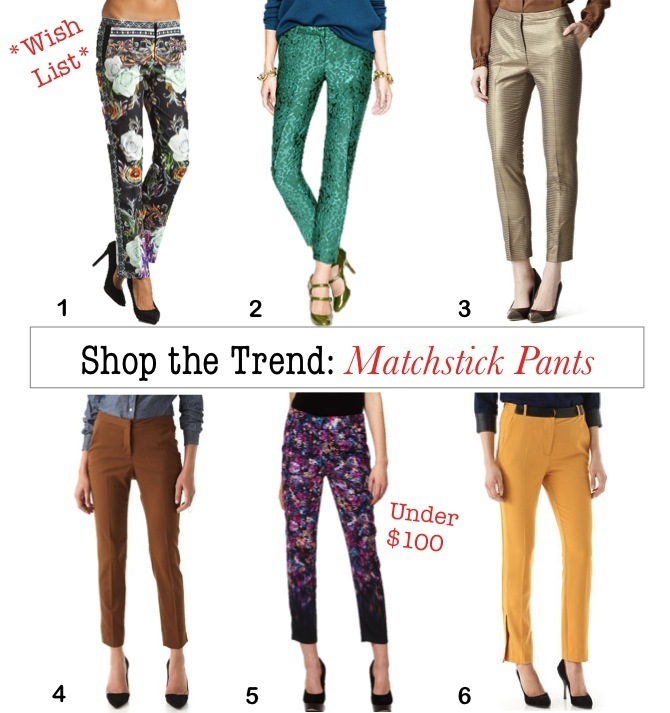 Coincidence -- I'm wearing a pair of matchstick pants right now! They're a great style, and they are flattering on a lot of different body types.